← Season’s are Changing and Cooler Temperatures Are On The Way! The Winds of Change Have Begun. 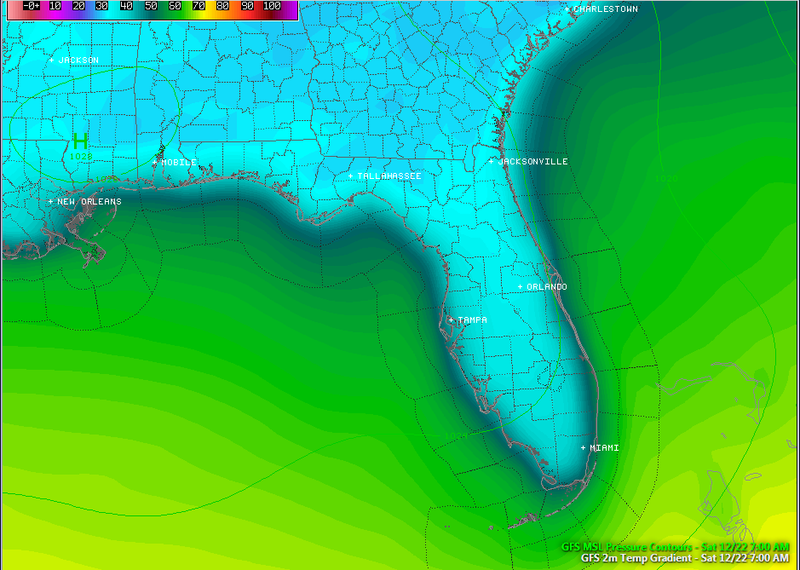 The Second Freeze of the Year is Expected in Northern Florida! This whole storm is pushing ENE, and should intensify overnight. The NWS Storm Prediction Center believes that this system will be strong enough through early Friday morning that they have outlined a slight risk of severe weather from Arkansas to the eastern Carolinas between now and Friday morning. I still believe that the main threat east of the Mississippi will be high winds. The models have backed off a tad on the winds above the surface, and I think that the threat is slightly less than I saw yesterday, however the threat is still there. If anyone has plans to go out onto the Gulf waters tomorrow, take caution. There is a small craft advisory in effect for the eastern Gulf as well as a gale watch for the high winds. Sea heights may be as high as 4-6 feet and winds in the unprotected waters may be as high as 25 kt. Winds on shore may be as high as 20 mph, or higher in the stronger storms. Like I said above, the main threat is high winds as this system pushes east. I think a few spin up tornadoes are possible, however the turning and lift in the atmosphere that is necessary for tornadoes will be lacking. Winds will be gusty, especially in north Florida. Timing: The pre-frontal storms should reach the Florida panhandle by late morning and the trailing front coming through by early afternoon. I expect the energy that will be necessary for strong to severe storms to occur will pull north with the main low pressure system by late afternoon tomorrow. With that, I think the line of storms will diminish in intensity, however I do think this will stick together as a solid line through Central Florida. This front will reach central Florida shortly after midnight. With the loss of heating and energy, I think that the front will become more diffuse as it reaches south Florida during the morning hours of Friday and into Friday afternoon. Severe Threat: The severe threat should be confined to north Florida west of the Suwanee River and the deep south. I believe the best chances of high winds will be in central Alabama to southern South Carolina. Rainfall: Much needed rainfall will come from Arkansas to the Carolinas from this system. Totals will be just under an inch in the area listed above as having the best severe weather chances. Most everyone else north of I-4 will get between a third and two thirds of an inch of rain. If you’re viewing from the midwest, you can expect 4-8″ of snow from central Iowa to central Michigan with the highest totals near Madison. Snowfall totals could top more than a foot of snow! Temperature Change: Temperatures will tumble as this front comes through. In north Florida, highs will drop from the upper 70’s to the mid 50’s and lows will take an even farther tumble. Lows Saturday morning could be as low as the mid 20’s in some area, and throw in the expected wind, and you could get wind chills in the upper teens to low 20’s. I still think the freezing line could cross the turnpike in central interior Florida with Orlando remaining in the mid to upper 30s. Metro south Florida could drop into the upper 40s and low 50s, and the Keys could drop into the mid 50s. Be prepared for the cooler weather! I’ve attached the 18z temperature forecast for 7am Saturday below. Although this frame does not accurately show lows for the morning, you should be able to get a good idea on how cold it will get. This will be the second freeze of the year for much of the northern third of Florida, but plenty of greenery was not killed off during the first freeze, or some of that has grown back since. Make sure you bring in any fragile plants before the front rolls through. Also, if you have anything that will easily blow away and you are from the northern part of the state, you may want to bring it inside. 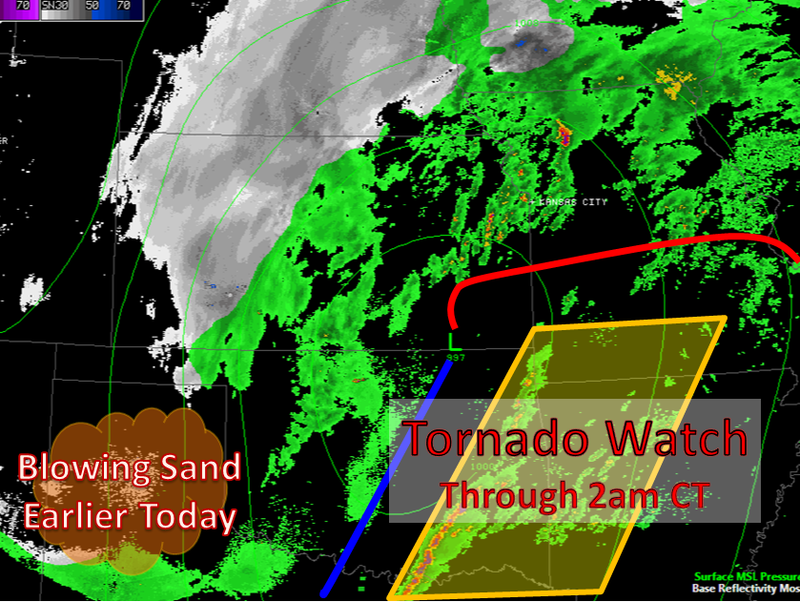 Stay safe and keep an Eye on Weather! Posted on Wednesday, December 19th, 2012, in Florida Weather, Severe Weather, Winter Weather. Bookmark the permalink. Leave a comment.